SEE THE PAYPAL LINK BELOW ..
A daily meal plan and a workout program to keep you on track and maximizing your weight loss every day! Step 1 Start up 3 days of prep info via files and video tutorials to get you revved up and ready. You can watch and rewatch any of the videos as many times as you like. The programme can be repeated at any point and over 90% of users complete the programme more than once. The support from the group and Gail will keep you motivated through to a complete lifestyle change. What’s so Special About The SLAC ENHANCE Program? There are many diets out there offering a quick fix but could you stay on them for a lifetime without getting bored, tired, or suffering malnutrition? ENHANCE is about Being able to make choices and without cravings and hunger. No extra hidden costs or supplements. How is this programme so effective? The advice is there 24/7 if you need help. There is no calorie counting or special extra foods at your cost. Its fun and informative and will change your lifestyle for the better. Daily Instructions on what foods to eat. Extensive Shopping List for start up and what foods to add in as you move forward with your lifestyle. Daily Videos to support your personal goal ie YOGA , STABILITY BALL, KETTLEBELLS, etc. 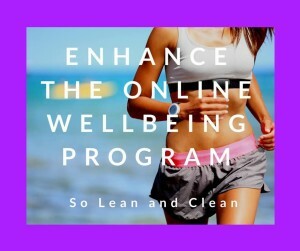 24/7 support from your on line personal trainer. Day 2 Motivational Instructions.. What is YOUR motivation?